Two women related to a fugitive from justice were staffers at the office of one of the Brazilian president’s sons at the Rio de Janeiro state legislature until late last year, a newspaper reported today. The office of former state representative Flávio Bolsonaro, a senator-elect and the son of president Jair Bolsonaro, employed the wife and the mother of a police captain accused by the Rio de Janeiro prosecution of being the head of the “Crime Office,” a syndicate suspected of murdering councilwoman Marielle Franco and driver Anderson Gomes, newspaper O Globo reported today, Jan. 22. The women were staffers at Flávio Bolsonaro’s office at the Rio state legislature until November, 2018. A fugitive from justice, Nóbrega is accused of being involved in homicides for more than a decade. He was honored by Flávio Bolsonaro at the Rio de Janeiro state legislature in two different occasions: in 2003 and 2005. The captain is also a friend of Fabrício Queiroz, a former aide of the president’s son who is being probed for illegal banking transactions. Nóbrega’s mother, Raimunda Veras Magalhães, and his wife, Danielle Mendonça da Costa da Nóbrega, earned R$6,490.35 from Flávio’s office, nearly seven times the national minimum wage in 2018, and were dismissed on Nov. 13, 2018. A few months earlier, in August, O Globo had reported on a so-called “Crime Office,” a criminal organization with members from military police forces, former police officers, and militia men, allegedly headed by Nóbrega. Raimunda is reportedly one of the servants who made payments to Queiroz’s bank account that is now being probed by Brazilian authorities. The former aide allegedly recommended the two women for the position at Flávio Bolsonaro’s office. A report by the Council for Financial Activities Control (COAF) based on data from Brazil’s federal revenue service shows Raimunda owns a restaurant located in front of the Itaú bank branch where most of the payments to Fabrício Queiroz’s account were made – seventeen unidentified cash deposits adding up to R$91,796, roughly US$25,000. A Federal Prosecution Service official reported the money was paid in identical amounts, a sign of money laundering. Adriano Magalhães da Nóbrega is a former member the BOPE, Rio’s elite police force, and has a criminal record. He was arrested during Operation Finger of God in 2011, which fought jogo do bicho operations, a popular, yet illegal gambling game in Brazil. In 2003, Flávio Bolsonaro, a state representative at the time, honored Nóbrega’s “brightness and chivalry” and commended his “community spirit.” Two years later, he granted him the Tiradentes Medal, the highest honor from Rio’s state legislature. 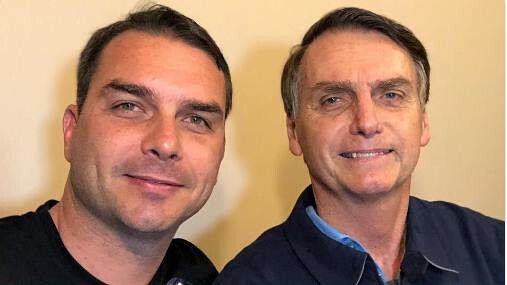 Flávio Bolsonaro took to Facebook to release a statement this afternoon claiming Nóbrega's mother was hired by Fabrício Queiroz to work in his office. “I cannot be held accountable for actions I was not aware of and that were only made public now based on information from this agency [COAF],” the senator-elect wrote. “I have emphatically stated that everything should be proved and those responsible [for the illegal activities] should be tried in a court of law. Regarding the family relationship she has, being the mother of a convicted fugitive, I will once again state it’s yet another irresponsible assumption made by those who intend to defame me. As for the honors granted to military officers, I have always worked to defend law enforcement agents and have granted hundreds of honors to different people,” his statement reads.